Regardless if you are a midcareer professional or interested in finding a new and meaningful career, do not forget to use the power of your master of public administration (MPA) degree to achieve your professional goals. During the process of earning your MPA, you have acquired the knowledge and skills pertinent to working in the public or private sector. Also, your efforts as an MPA graduate illustrate your commitment to self-improvement. Now it is your responsibility to build professional momentum and spell out what you can offer to any employer. Here are four ways to highlight the value of your degree. 1. Your MPA is a professional degree. 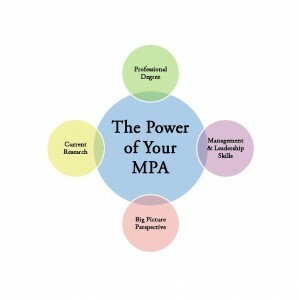 When talking to employers, emphasize that an MPA is a professional degree. The general purpose of a professional degree program is to advance the knowledge and skills directly applicable to job-related practices. MPA graduates are well prepared to step right into a career position and produce desired outcomes and results. Ability to plan, organize and prioritize work. Ability to verbally communicate with persons inside and outside the organizations. Ability to obtain and process information. Do not wait for your employer to make the connections between an MPA degree and practical skills. Your journey to earning an MPA developed the professional skills mentioned above. You need to talk about and demonstrate these skills to employers. 2. MPA programs foster management and leadership skills. Displays high integrity and honesty. Solves problems and analyzes issues. As an MPA graduate, you learned the theories, skills and techniques of leadership and public management. Demonstrate how your critical thinking skills help you to analyze and solve problems. Describe how earning an MPA requires integrity, honesty and a drive for results. Support your communication skills by verbally expressing educated and innovative ideas. Utilize any MPA research project to highlight your proficiency in written communication. Finally, most MPA graduates chose their path based on the need to make a positive impact on their communities or society. Explain how you can use your desire to produce meaningful work to inspire others. 3. You understand research methodology and grasp the applicability of current research. Throughout your MPA program, you gained significant experience with research methodology. You can interpret and apply tentative conclusions to practical information and solutions. Explain the benefits of knowing and utilizing current research to your employer. First, you can make informed decisions. Second, you are adaptable and willing to embrace new ideas. Lastly, current research can be used as a tool to increase your network of contacts in your field. The bigger your network, the more beneficial you are to your employer. 4. You see the big picture. Simply stated, MPA graduates understand how to work across multiple sectors. You are capable of responding to and fulfilling the professional demands in the public, nonprofit and private sectors. Also, you understand the dynamic of public-private partnerships. More importantly, making a positive social impact is becoming a notable stance of many successful businesses and you possess the skills needed to hit the ground running when it comes to making your society a better place to exist and do business. The purpose of this article is to show MPA graduates (or future graduates) that your degree is powerful and valuable. However, an MPA following your name or listed on your resume should not be the only way you market or brand yourself. Make opportunities to discuss and demonstrate the applicable knowledge, skills and techniques you acquired with your current or future employer and network of colleagues. Your MPA is part of your professional brand now; you need to promote it accordingly. Author: Melissa Kumle-Hammes, MPA, works for a Midwest-based consolidated dispatch center as a public safety communications professional and is a graduate student at Walden University, Ph.D. program in Public Policy and Administration, Emergency Management specialization. Ms. Kumle-Hammes can be reached at [email protected]. Thank you for presenting a concise picture – helps out greatly! This is a great way of framing our new knowledge. Thanks, I will definitely use this in interviews! Thank you for reminding me how valuable my MPA is.